This was the show that was due to mark Michelle Dockery (Downtown’s Lady Mary Crawley) return to the stage. But in October she pulled out and would no longer be playing Madame de Tourvel, the woman of high moral virtue overwhelmed by arch seducer, Le Vicomte de Valmont. Perhaps she did not care for surrender under such circumstances, albeit in the arms of Dominic West’s Valmont! At any event, Elaine Cassidy who took her place at comparatively short notice, does a fair job of showing virtue breached. All eyes however in Josie Rourke’s handsome revival of Christopher Hampton’s 30-year old award winning adaptation of Pierre Choderlos de Laclos’s scandalous 18th century, pre-revolutionary epistolary novel (later made into an equally successful film by Stephen Frears) are on the combative, competitive battle of the sexes between Janet McTeer’s Madame de Merteuil and West’s Valmont. Full of bonnes mots and witty cynicism, it perhaps shocks less in these post-modern days. Albee’s Who’s Afraid of Virginia Woolf is but one of a number of classics that have now entered the public consciousness where former lovers play out vindictive point-scoring on passing innocents with ruthless dexterity – Madame de Tourvel being one victim, Cécile, recently out of the convent another and even Cécile’s suitor, Le Chevalier Danceny a third – only for the authors to reveal their own vulnerabilities. 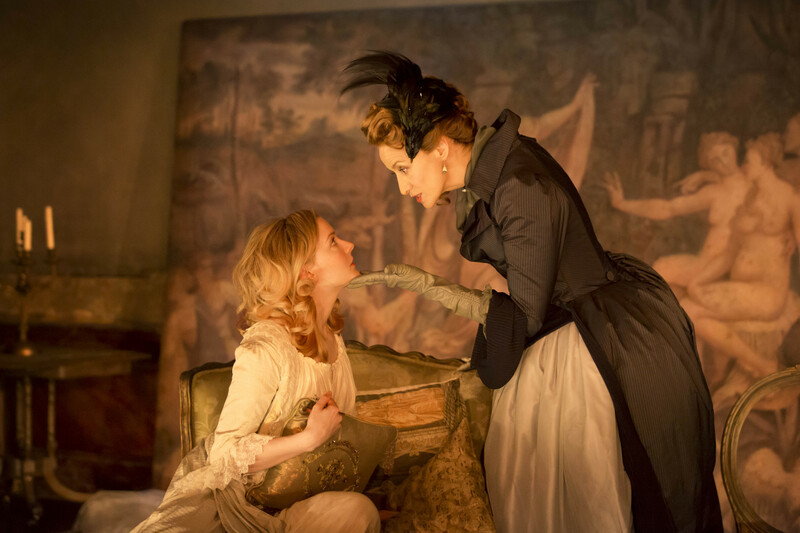 McTeer, silkily disarming and twice as dangerous, makes a magnificent bosom-heaving `monstre’ – addictively duplicitous as she argues in very 18th century liberal/feminist terms, it is her one power-weapon, as a woman, against life’s injustices. In contrast West’s Valmont initially lacks the reptilian carapace of either Alan Rickman or John Malkovich (in the film) but is quietly devastating in his seduction scene with Cécile and transparently emotionally destroyed by Merteuil’s final challenge for him to abandon Madame de Tourvel. The heart is a cruel hunter. 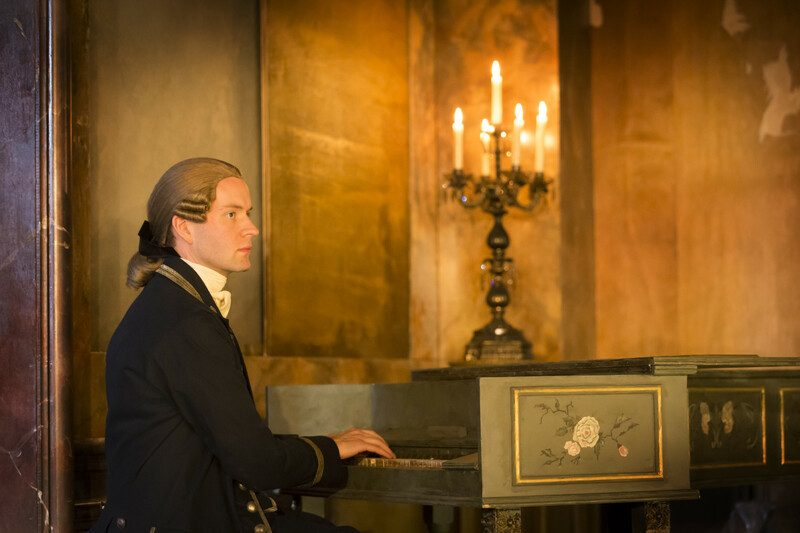 Josie Rourke’s ancien regime production with its broken and empty picture frames – and occasionally unfortunate sight-lines – tells us this is a society on the way out. The production and the play, however, on the contrary, are most definitely `in’. Much to savour in an intelligent night out. This entry was posted in 2015, Reviews and tagged 18th century sophisticated debauchery, Christopher Hampton, Dominic West, Donmar Warehouse, innocence deflowered, Janet McTeer, Josie Rourke, Laclos on December 20, 2015 by Carole Woddis.